Abu Jafar led us to a large tent, the community centre for the village. Al Khalayleh is situated in the ‘Seam Zone’ north east of Jerusalem, the area caught between the Israeli separation barrier, which in places has encroached onto Palestinian land, and the ‘green line’, the internationally recognised border between Israel and Palestine. 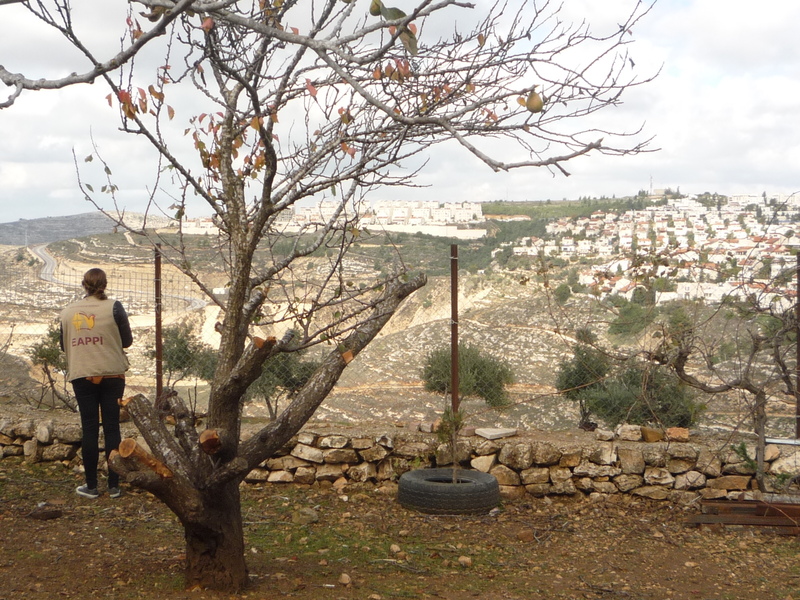 The barrier has split the village, leaving the 700 inhabitants of Al Khalayleh on the Israeli side cut off from their community and families of Al Jib on the other side. The village is surrounded by four illegal Israeli settlements, Givat Ze’ev, Givon (new and old) and Har Smoel, all of which are expanding. The village is surrounded by the Israeli separation barrier with some areas falling inside the Jerusalem municipal boundary and some areas outside. Therefore, some villagers have Jerusalem IDs and some West Bank IDs. The situation is different for the different ID holders. All villagers have to go through a checkpoint to get to their homes but those with a Jerusalem ID have more freedom of movement and can go into Israel. Abu Jafar has lived in Al Khalayleh all his life and has a West Bank ID. He can only go into the West Bank and to do that he has to go through a checkpoint. As he talks he builds up a picture of what life in the village is like for West Bank ID Palestinians since the building of the barrier here and the installation of checkpoints. No new people can move in to Al Khalayleh except if they marry someone who lives there already. Even then only men are allowed to bring their wives there; women cannot bring their husbands. It hardly matters. They are not allowed to build new houses, so when young people marry they usually move away. For Palestinians, whose culture rests on close family ties, this is a great hardship. Elderly parents and others who are old or infirm are absorbed into extended families. But here this entire safety net is removed. Villagers from Al Khalayleh can visit people in the West Bank, but people from the West Bank cannot visit them without a permit. Shopping is also a problem. It is okay to bring in groceries but not an item of furniture, a bottle of calor gas or a washing machine. Abu Jafar keeps a number of birds and animals and found that bulk animal feed also needs a permit. It takes a minimum of two hours to get a permit but it can take days. All of this is against Article 13 of the Universal Declaration of Human Rights which states we all have the right to move freely within our own country, to leave it and to return. The village is without basic services, no schools, no buses or a Post Office. Doctors from the Palestinian Medical Relief Service come once a week and hold a clinic in a container on Abu Jafar’s land. If people are seriously ill and have to go to hospital they have to get an Israeli ambulance to the checkpoint and then a Palestinian one from the checkpoint to a hospital in Ramallah. Children have to go through the checkpoint to go to school. Sometimes the soldiers search their school bags which makes them late. Many of the houses were built before the beginning of the occupation in 1967. Those built after 1967 were usually built without planning permission (which is almost impossible for Palestinians to obtain) and are therefore very vulnerable. Every few months or so another house or shop gets a demolition order. 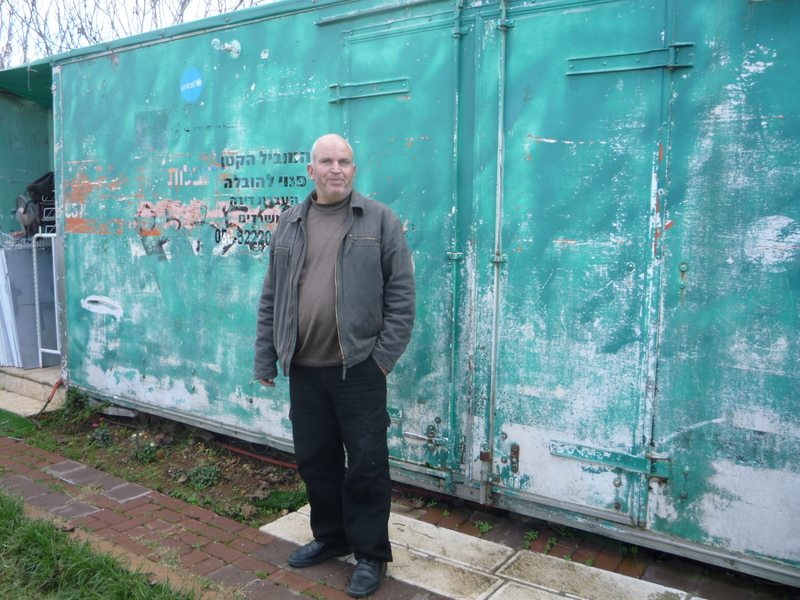 Abu Jafar mentions in passing that neither the container for the clinic nor the tent in which we sit have planning permission and could be demolished at any time. It is clear to Abu Jafar that the long-term plan is to remove all Palestinians from the enclave. I asked him if he would consider leaving. He replied, ‘You cannot just leave your home, your family, your land and go somewhere else. Where would I go?’. I asked Abu Jafar what gave him hope. There was a long silence while he struggled to find an answer. Then he changed the subject. This entry was posted in Access and movement restrictions, Current EAs, Demolitions and forced displacement, East Jerusalem, Economic conditions, Impact of occupation on children, Restrictions on access to worship, Separation Barrier, Settlements. Bookmark the permalink.